TRU‑ID sets new standards for an ergonomic, lighter weight, higher quality, double-jacketed fire hose. At the core of TRU‑ID is an exclusive “true internal diameter” of 1.75", 2.25" or 2.50". Manufactured to precision, this technology greatly lowers the overall hose weight by eliminating additional water found in over-sized attack lines — thus reducing firefighter fatigue. Virtually kink resistant, TRU-‑ID handlines are designed for use with low pressure/high volume nozzles built to reduce hose whip and optimize friction loss, all while delivering targeted flow rates, guaranteed. On the outside, our premium double jacket construction enhances flexibility while offering higher abrasion and puncture resistance for maximum dependability on scene. TRU-ID comes standard with lightweight, laser engraved, extruded aluminum alloy couplings. These anodized, threaded expansion ring couplings are guaranteed for the life of the hose. The laser engraved TRU‑ID logo is your assurance of genuine TRU‑ID technology. Classic performance in an innovative design and rugged construction guaranteed to withstand the rigors of the fire ground for years to come. Seize the power of targeted flows with command and control performance, specify TRU‑ID. Key Hose leads the way again, introducing TRU‑ID 2.25". Click to learn more about TRU‑ID 2.25", the new size for high-rise and high caliber attack operations. Available Diameters: 1.75", 2.25" and 2.50"
TRU‑ID comes standard with lightweight, laser engraved, extruded aluminum alloy couplings. Specific tracer lines shall be woven into the outside jacket to visually identify a genuine TRU‑ID hose. TRU‑ID hose is treated with a special “Key‑Lok” polyurethane based polymer impregnation for added abrasion resistance and ease in identification. The finished inside diameter of TRU‑ID hose shall be 1.75", 2.25" and 2.50" respectively, with a tolerance of 1.2% when measured according to UL‑19 standards. The minimum burst test pressure when tested in accordance to NFPA 1961on all TRU-ID hose shall be 1200psi / 82 bar. Service test pressures stenciled on the hose shall be in accordance with current minimum requirements of NFPA 1962. 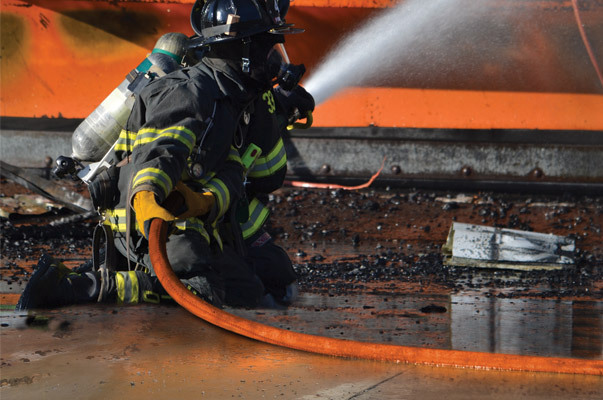 TRU‑ID hose shall meet and exceed all performance requirements of NFPA 1961 and MIL‑H‑24606 latest edition standards. TRU‑ID hose has a potential service life and warranty of 10 years, barring mistreatment that would render it unfit for service. Upon delivery, the hose shall be free from defects in materials and workmanship.